Your skin will go from dehydrated to dewy with this ultra-rich formula as it provides immediate and long-term hydration for a radiant complexion. The natural compound Polyfulmate™ delivers minerals, proteins, essential oils, and most importantly, moisture deep into your skin’s cells promoting skin firmness and a youthful glow for all skin types. All of the active botanical ingredients are natural, with no artificial colors or fragrances, so products may vary in color and texture. These variations should be expected and enjoyed; they distinguish our pure, all natural product from manmade imitations. 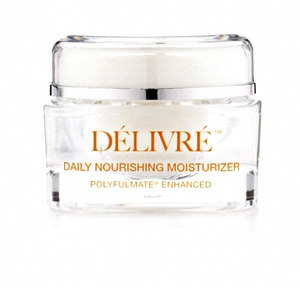 In order to get the best effects, our nutrient rich moisturizer should be messaged between the finger tips, and gently applied to clean skin. *These statements have not been evaluated by the Food and Drug Administration. This product is not intended to diagnose, treat, cure, or prevent any disease or medical condition. ©2019 by Délivré. All rights reserved.